Last week's review and giveaway for the Learn to Stitch Beaded Jewelry book garnered not just interest from beginners but also from more seasoned beaders. Paulette said, "I have been bead weaving for quite some time, and I have to admit I have not yet even tried the square stitch, and I usually only use brick stitch to start a herringbone piece. The circlet collar looks like an awesome way to try my hand at a less used technique." She is right - we tend to be creatures of habit. So this book inspires beaders to explore gaps in their repertoire. Wayne Wiley made another excellent point, "Even if you have been beading a while, it's always a good idea to review techniques. It always makes sense to make sure that you haven't started using bad habits." So who won? I numbered all the eligible entries and got the random number generator over on random.org to do the picking. The winner is Betsy! Congratulations! Betsy - I am not sure if your email on your blog is still correct. Please email me before next Monday to claim your prize. Otherwise I will redraw. Didn't win? 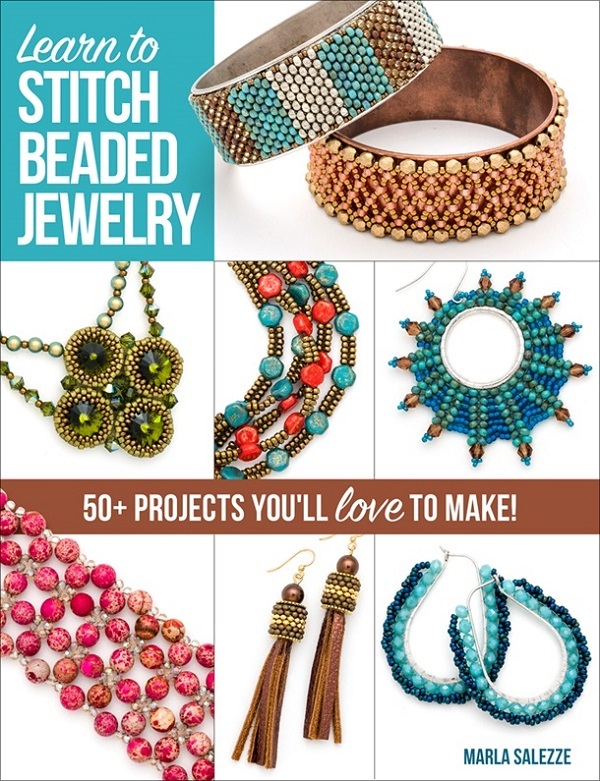 You can get Learn to Stitch Beaded Jewelry from Amazon and other booksellers.